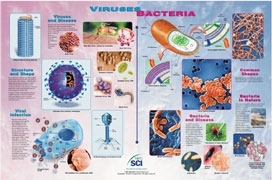 Take a closer look at the most prevalent disease-causing viruses and bacteria known to man! Your students will also learn how to identify these agents and how they cause harm to humans. The detailed illustrations and actual photographs make this an indispensable tool for teaching your students about this critical topic. Size: 35"W x 27"H.